The Sphynx cat was specifically bred to be an almost hairless variety (they actually have a fine layer of fuzz). Its appearance may take some getting used to...but these rare kitties are actually quite warm and cuddly. Their skin temperature is warmer than typical cats, and because they don't have a fur coat, they really enjoy curling up next to you when it's time for a nap. 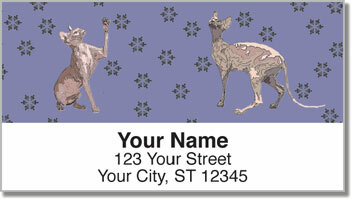 Stick these original return address labels on all your letters and packages to let everyone on your mailing list know how much you love your Sphynx cat. 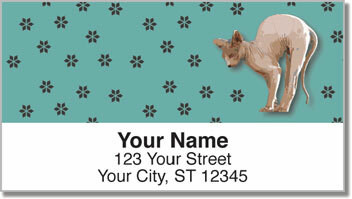 This product is printed on a self-adhesive backing. So the task of preparing outgoing mail will become super simple. 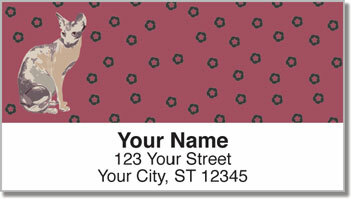 Just peel and place your return address on every envelope. 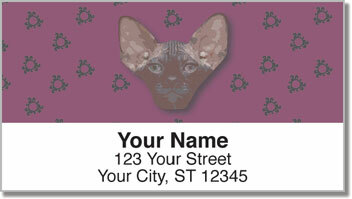 Order your own Sphynx Cat Address Labels today! You can also get matching personal checks.